We all dream of being our own boss. 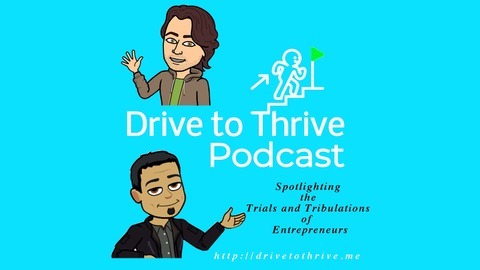 Drive to Thrive Podcast spotlights the trials and tribulations of starting your own business, and becoming an entrepreneur. Real conversations with real entrepreneurs around starting and running your own small business. Join us weekly as we spotlight 1 to 2 small business owners who will share their story. 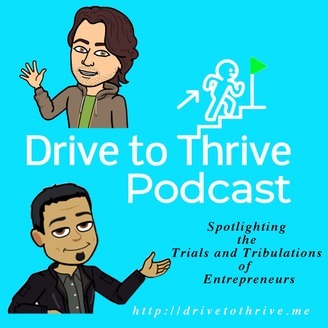 From former Corporate Management to former NFL players, College Dropouts to Former Wall Street Gordon Geckos, Drive to Thrive opens the door to tough conversations around failure to success....and sometimes back to failure! Stay tuned and please subscribe for updates! http://drivetothrive.me. We all know the stresses and anxiety that entrepreneurship brings. Jessica Bucceri knows anxiety all to well. Being bullied in high school and the passing of her grandmother threw Jessica into an anxiety ridden tailspin. She acquired not just your every day anxiety. She acquired agoraphobia which makes you fear and avoid public or crowded places. Using baking as her medicine Jessica didn't let her anxiety deter her pursuit of her passion of baking. She's been on TV's Cake Wars, opened JB Couture Cupcakes in Belmar, NJ and is getting ready to go big or go home! We hope you enjoy Tom & Joe's interview with this super strong and young entrepreneur who is truly triumphing over her fears.